Singing in the classroom can have a strong connection to enhanced early literacy skills. 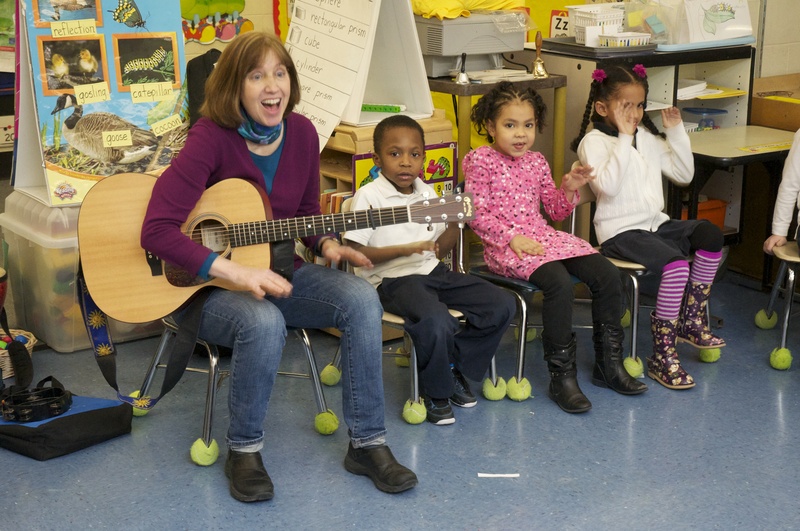 Many academic studies have shown a strong connection between musical activities and early literacy learning. One study that especially interests me is detailed in “Early Language Learning With and Without Music,” by Douglas Fisher, published in Reading Horizons in 2001. The study evaluated four classrooms of students in kindergarten and first grade. The students were all English Language Learners who spoke Spanish at home. Two of the classrooms began the day with a song and added particular musical activities to reading instruction time, while the other two did not. The students in the classrooms that used music scored higher on reading assessments. Most of the preschool and kindergarten teachers I meet understand the power of music for their students, but they often don’t know how best to use music to enhance student learning. Most early-reading curricula give some lip-service to singing (no pun intended). A song may come with each week’s lesson plans, but the song seems an afterthought and not that engaging. To put it nicely, these songs aren’t destined for the top 40. As I’ve worked as a teaching artist in kindergarten classrooms, I’ve had teachers ask for particular songs to work on certain skills. The teachers (and their students) were tired of rote chanting of letter sounds and rhyming word families: B-Buh-Baseball and fat-cat-sat-mat. I was able to make musical connections that made the lessons more engaging for both teachers and students. I’d love to see more teachers trying these songs in their classrooms. In my collection, Songs for Rhyming and Reading, there are songs for clapping syllables of words, emphasizing starting consonants, reciting long and short vowels, guessing rhymes and making word families. You can find this collection and many other early literacy-related songs on my page at Songs for Teaching. The rhyme-guessing songs can turn rhyming skill learning into a game. In “Icky Sticky and Ooey Gooey,” kids guess rhyming body parts. In “Vowel Jamboree,” students sing long and short vowel sounds, rather than simply reciting them. It adds extra fun to letter sound lessons. For starting consonant sounds, teachers can try the classic “Muffin Man” with many added verses for other starting consonant sounds. These songs are simple but fun, and just might take some of the drudgery out of phonological awareness learning. And they might help improve those assessment scores! Great blog as always Liz and wonderful to know about this research. My last principal credited the rise in kindergarten scores to the overall curriculum including my literacy skills through music program with the children that year…. Once again, something we musicians understand but it’s so helpful to have the backup! And I always enjoy using your material, which you so generously share!